The Glassfiber Transfer ElectroStatic Carrier (Glassfiber T-ESC®) enables temporary bonded wafer thinning without the need of adhesive, starting from a thick wafer grinding down to ultra thin wafer thickness. This mobile rigid wafer support helps to generate high yield even when going to the ultra thin wafer thicknesses. Furthermore this mobile electrostatic Carrier can be used in process applications such as handling and probing. Grinding is a substrate thinning process, where material is mechanically removed. During Wafer processing the wafer needs to be transferred back and forth from cassettes to tools and also inside the tools from on station to the other. For fragile substrates this is already challenging, because they tend do brake or get cracks, which can lead to future breakage. Also bowing of thinned substrates brings a lot of trouble for all tooling because they are usually not designed for this very special operation. Temporary bonding with our T-ESC® is a great help here as the processing tools only see a standard wafer and trouble with handling, therefore wafer breakage is eliminated. Various probing methods exist, they are used to check the substrate´s or device´s functionality, e.g. there are optical inspection or electrical probing. 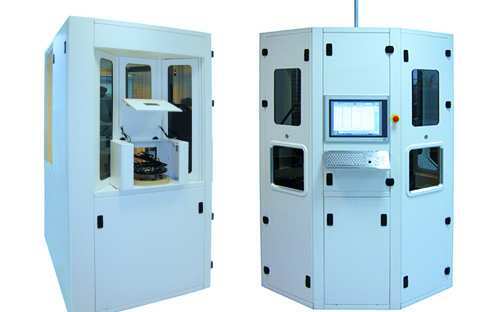 A fully automated electrostatic chucking/de-chucking unit with up to 120 wafers and/or T-ESC® packages per hour, guarantying an highest yield during handling and many diagnostics features. A manual chucking / de-chucking unit of thin and ultra-thin substrates on carriers T-ESC® for flexible sizes from 4”/6” to 8”/12” with a high flexible mobile handling tool and diagnostic features.